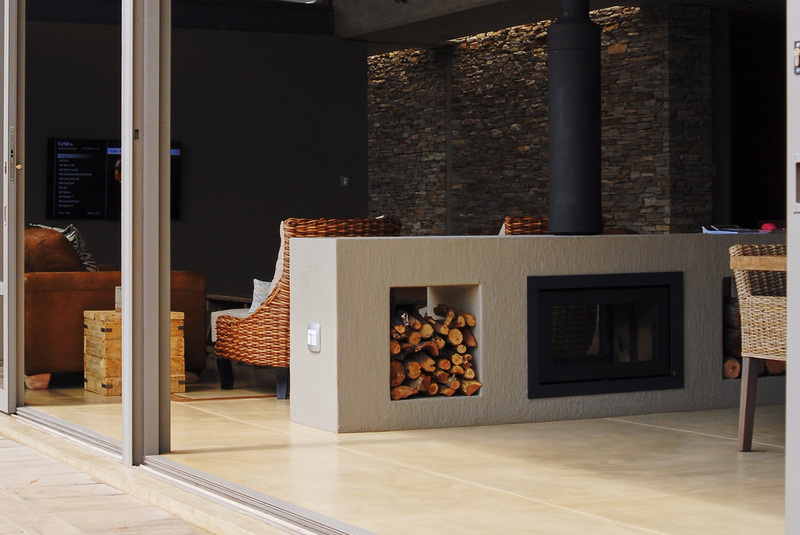 Cemcrete‘s Colour Hardener floor finish in the colour Cobble Milk was used and provides the home with a unifying element throughout, contributing to the modern bushveld look. We asked Andrew Payne, Managing Director of Drew Architects, a couple of questions to find out what the vision for the home was. What was the brief given to you before starting the project? As architects, but also proud South Africans who also love the bush, our vision to create a home which imbued a real sense of what it is to being away in the bushveld: in the way the home is experienced; in the planning and circulation within the home; in the materiality of the home; in the way light is brought into the home; and the dialogue between architecture and landscape, man and nature. A characteristic of Drew Architects buildings is that they generate interest and impact by offering a collection of different, experiences rather than a one-dimensional approach. Planning of the home structured around a series of large mass dry-packed stone walls, treated as if almost already pre-existing on the site. Our approach was to then lightly ‘clip’ our collection of light mono-pitch steel pavilion buildings to these natural stone walls based on their function thereby creating a series of different experiences and a series of gardens and courtyards each with their own privacy and sense of identity. The sense it that each component of the home almost has its own identity and ownership to its own piece of nature beyond the large glass doors and windows. The connecting spaces are intentionally mostly glazed flat concrete roof ‘boxes’ which intimately connect one with nature and increase the sense that one is leaving one part of the home and journeying to another as one would move on winding timber decking under a canopy of thorn trees and African sky between suite and main social space in any luxury bush lodge experience. The buildings are situated in an east west direction orientating them a few degrees east of north – the optimum orientation in South Africa, in order to maximise the solar radiation into the home. The north facade of the building is mostly glazed but takes advantage of the mono-pitch roof overhang which invites in all of the low winter sun, but excludes the midday summer sun which would likely overheat the space. High level clerestory windows also invite in natural light but in addition give the building a sense of lightness as the mono-pitch roof plane seems to ‘float’ above the solid walls below. Long strip skylights run along the length of the stone spine walls bringing them alive with natural light and shadow without letting in too much heat. What made the Cemcrete Colour Hardener application so spectacular is the size of the area covered, over 300 square meters of flooring was completed over a two week period. Over a ton of Colour Hardener product was hand applied by a team of twelve from Cherubinos. One of the biggest challenges on site was that the north facade of windows were only installed after the Colour Hardener application was completed and the floors had to be protected from the rain during its curing time. A Kiaat wood inlay was installed by Mike Made This and incorporated into the Colour Hardener floor in the lounge. Colour Hardener floors can also incorporate inlays such as brick, wood or tiles to name a few. These inlays also become functional as they act as movement joints. The Colour Hardener Cobble Milk floor finish flows into the bedrooms and bathrooms, right into the shower with a door leading into the garden. For the fireplace surrounds dividing the main bedroom and bathroom (as well as the lounge and dining area) Cemcrete‘s CemWash in the colour Slate was used. CemWash is a brush-on interior and exterior wall coating that creates a uniquely rough textured finish. Colour Hardener is a dry shake powder that is applied on top of a damp screed. The pigmented powder is then worked into the surface with a wood float penetrating into the screed and essentially becoming an integral part of the floor. It isnot the easiest product to apply on the risers of stairs and therefore showcases the technical ability of the application team involved. The impeccable quality of the finish of the Colour Hardener, especially on the staircases, is one of the elements that made the project stand out from the other entries. Furthermore for the exterior staircase a special tool was created by the application team to reduce the slipperiness of the floor. We would like to congratulate the applicators of the Cemcrete finishes, Viv-Lovell Harris from Cherubinos (powered by Stuart Wolfendale’s team), and the architect of the home, Drew Architects, for winning the Cemcrete Joburg Project of the Year 2015 and thank you to all the entries received.Let us know what you think of the winning modern bushveld family home in the comments section below.